The Chang Park Resort & Spa is in the north of Kai Bae Beach on Koh Chang Island in Thailand. Chang Park Koh Chang offers bungalows, hotel rooms, honeymoon suites, holiday houses and beach villas for luxury holidays in Thailand. The private Jacuzzi pools and the great view from the swimming pool make Chang Park Resort to a unique holiday accommodation next to the Gulf of Thailand. Atlong the main road of Kai Bae are sea food restaurants and shops for pleasant trips and nightlife on Ko Chang. The walking street invite for walking and grubbing in Kai Bae. 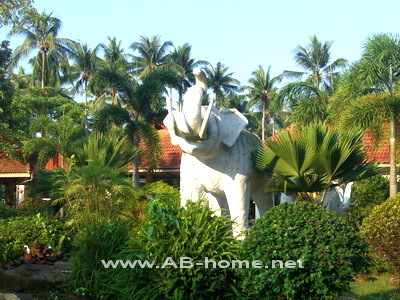 The holiday houses of Chang Park Hotel are perfect for families and travel groups on Chang Island in Thailand. Chang Park Resort and Spa is rightly a accommodation choice for many Thailand traveler and Asia tourists who like comfy hotels on a perfect exotic beach with coconut palms and crystal clear water. Check this booking system for promotion hotels and Koh Chang accommodation.